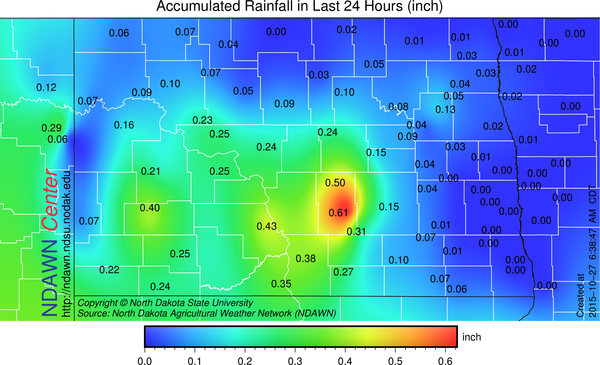 On Monday, October 26, 2015 parts of central and western North Dakota recorded between 0.20″ and 0.40″ of rain with some localized higher totals. Eastern North Dakota into western Minnesota generally just recorded a trace of rain or a hundredth or two. The rain was associated with an upper air disturbance in combination with a surface low pressure system. The low pressure in western South Dakota is expected to move northeasterly toward Manitoba today. Additional precipitation looks light and somewhat hit and miss in North Dakota. A much larger area of precipitation is expected in Minnesota that is associated with a piece of what use to be Hurricane Patricia. Most if not all of that moisture is expected to stay to the east of the North Dakota Agricultural Weather Stations in western Minnesota. As the cold air moves in behind these two systems, the remaining moisture expected on Wednesday may mix in with snow at some locations, but no accumulation is expected in North Dakota. Some parts of northern Minnesota, especially east of the NDAWN station in that state, may see a brief accumulating snow. With snow even being mention and it will likely NOT occur in all areas, it will obviously not be all that warm. Maximums in the upper 30s to the middle 40s is foreseen on Wednesday and similar temperatures are expected on Thursday, especially in the eastern one-half of North Dakota, but then a nice warm up is expected with upper 40s to mid 50s on Friday and in the 50s this weekend with a few sites even reaching 60° on Saturday a good bet if the sky is sunny enough. Another mild day for early November is projected for Monday, November 2, then a cold front moves through on Tuesday with a threat of some rain showers, and cooler air for the rest of next week. Although, at the moment, the threat of rain next Tuesday appears to be the only precipitation maker next week.